Alburgh post mill had a single storey roundhouse and a tailpole. The mill was powered by two common sails and two double shuttered patent sails, each with 7 bays of 3 shutters and 1 bay of 2 shutters. The mill was almost certainly Hardwick_west_postmill that had been brought the 4 miles to Alburgh on a trolley by its builder, millwright Stephen Cox c.1826, which would mean that it was probably erected to replace the earlier mill destroyed by fire in May 1819. The mill was then reputed to be the biggest postmill in the county. The mill stood some 150 yds southwest of Mill Farm, which was on the oposite side of the road. The mill was not connected with the farm and had its own Mill House and smallholding of 7 acres, 1 rood, 26 perches. In its early years, the mill and its site appear to have been owned by the Gower family, who at times lived in the Mill House. However, it also appears that the mill was worked by or let to various other millers. Stephen Cox the millwright was born c.1815 at Mendham and in 1841, 1851 and 1871 worked as a miller. He was living at Hardwick c.1864 and in 1869 and 1871 was living at Aldburgh and was also a farmer. No other reference found to him working as a millwright. His son, Stephen Cox the miller was born at Woodham Mortimer, Essex in 1850. Wanted a single man as Miller. Apply R. C. Harvey, Alburgh, Harleston, Norfolk. Monday last near Harleston, the Tower Wind Mill of Mr. Harvey, Alburgh, was entirely consumed by fire, supposed to have originated by the overheating of the gudgeons. 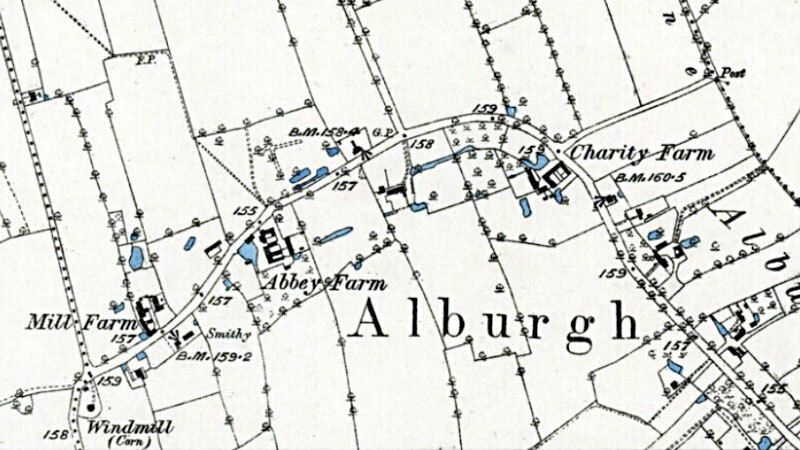 It appears that Robert Harvey and Edward Hill were involved in the running of several mills including Alburgh postmill, Wortwell Mil Hill postmill, Wortwell postmill and Wortwell watermill. Millers, Flour Merchants, Dealers & Chapman, co-partners in Trade to surrender 26 January instant. Commission of Bankrupt dated 24 Dec. 1825 against Robert Crytoft Harvey, of Alburgh, Co. of Norfolk, and Edward Hill, of Wortwell, said Co., Millers and Flour Merchants. Accounts to be audited. Commission of Bankrupt awarded against Robert Croft Harvey of Alburgh in the Co. of Norfolk, and Edward Hill of Wortwell in the said Co., Millers and Flour Merchants and Co-partners. Harvey to be issued with certificate 5 November next. Hill v. Saunders. - This was an action brought by Mr. Edward Hill, an extensive miller residing in Dickleburgh, against the defendent, a baker who is living in the same parish. The parties it was stated had had considerable transactions for several years and there being an unsettled account between them, the defendent was requested to give a note of hand for the balance which might be found to be due. He accordingly gave a blank note of hand to the plaintiff in which was afterwards inserted the sum of 384l. 12s. 2d. as the amount due from the defendant to the plaintiff. This sum the defendant distrusted, considering it was much more than he owed, and representing by his Counsel that on the balance of accounts there was actually a sum of thirty odd pounds due to him from the plaintiff. Mr. Kelly having briefly stated the case, the same was referred by the consent of parties to Mr. James Smith Rump, or Norwich, and a verdict for 384l. 12s. 2d. taken for the plaintiff, subject to such reference. Lot 3. A Desirable Property known as “ALBURGH MILL”, Alburgh, Norfolk with Dwelling house, Building & nearly 8 Acres of productive Land, let to Mr. COX on lease for four years unexpired at £50 per annum. Particulars & Plans may be obtained at the place of Sale, of Wm. HARTUP, Esq. Solicitor, Bungay & of Mr. DEBENHAM, Auctioneer, Land surveyor & Estate Agent, 80 Cheapside, London, who will forward them by post on application. A Capital POST WINDMILL on brick roundhouse, situate in Alburgh, Norfolk, with Dwelling House, Buildings & nearly 8 acres of productive Land, let to Mr. COX on lease for four years unexpired at £50 per annum. Apply to Wm. HARTCUP Esq. Solr. Bungay or the Auctioneer, Wissett near Halesworth. On the 22nd November, at the parish church, Alburgh, by the Rev - COMBE, John, fifth son of Mr. William ALDOUS, earthenware manufacturer, Beccles, to Susannah, third daughter of Mr Stephen COX, miller, Alburgh, near Harleston, Norfolk. Containing 7a. 2r. 2p. of Arable & pasture LAND, with DWELLING HOUSE & Freehold Post WINDMILL. Also spacious Blacksmith’s & Wheelwright’s Shops, with Dwelling House & Garden. Messrs. HAZARD & PRATT, Harleston, Vendors’ Solrs. Auctioners’ Offices Cantley, Yarmouth & Harleston. A Desirable OCCUPATION containing 7a. 2r. 2p. of Arable & Pasture LAND with Brick & Tile RESIDENCE, PREMISES & Freehold Post WINDMILL in good working order, late in the deceased’s occupation; also a Freehold DWELLING HOUSE near Lot 1 with spacious Blacksmith’s & Wheelwright’s shop. All Land Tax Redeemed. Auctioneers’ Offices Cantley, Yarmouth & Harleston. Sale of Stock in Trade & other Effects for the Executors of Mr. S. COX, deceased. Was a post mill. Cox had it. It got out of repair and was pulled down some 40 years ago. Mr. Herbert George Cox, of the Wellington Inn, at Chediston Green, near Halesworth, Suffolk, where he has been a licensee for thirty-five years and is now retiring, is the third generation of a south Norfolk milling family. He is 71 years of age. “My grandfather, Stephen Cox", says Mr. Cox, “was a mill-wright. My father Stephen was a miller. My grandfather built the post mill at Hardwick, Norfolk, and moved it on a trolley to Alburgh. Then he erected a brick round house for it. Its sails were so light that there were days when they would be turned, but those of other mills for miles round were stationary. They were made of sail cloth. 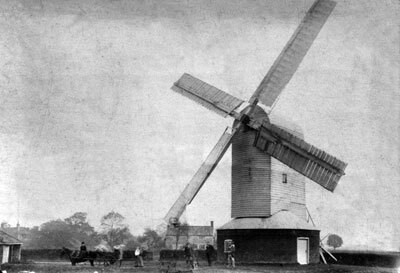 This was the biggest post mill in Norfolk”. William Cox (10) b.Hazeleigh, Essex.